*Please note that there may be heavy access traffic before the quiz period closes. There is no specific requirement to participate Anisong ☆ KingDAM conducted on the web. However, in order to participate in the final match of Anisong ☆ KingDAM during AnimeJapan, it is mandatory that you can be physically present at the designated stage show. Please check the precautions below for other information about the final. It is quiz about anisong and anime. * Time counting will start once you click the "Start Answering" button on the special website, until you submit the answer. Mar.11 [Mon] 13:00, 2019 ~ We will announce high achievers' nickname and examinee number on the web. Administrative Office will email the selected finalists by Mar.11 [Mon] 13:00, 2019. If you did not receive our contact by then, please assume not selected. Nicknames will be presented at the time of result announcement. 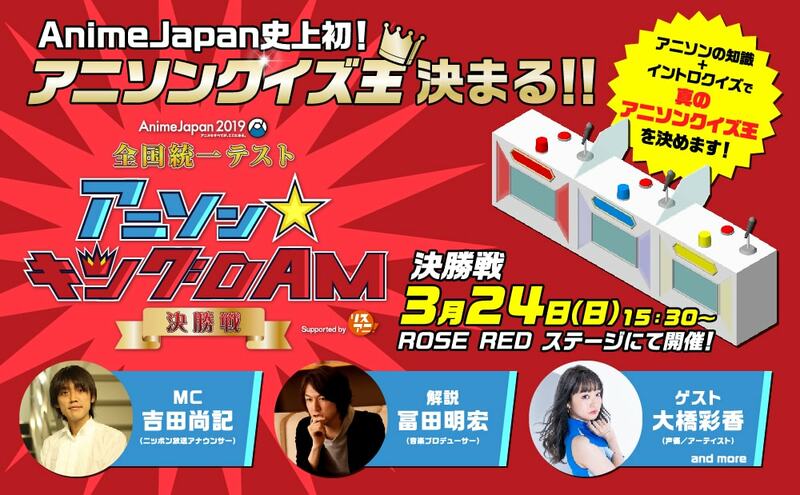 You can participate in the final match (on Mar.24, 2019) at "AJ2019 National Test: Anisong ☆ KingDAM". Your intention to join will be confirmed at the time of account registration. Presenting an exclusive AJ2019 admission pass with your picture! *Those 3 finalists will be selected based on their number of correct answers and finishing time. You must register for account on the special website. Each person can register for only 1 account as a general rule. It is open to all ages and nationalities. However, because the quiz will be conducted in Japanese (some content may use non-Japanese languages), those who understand Japanese will be in advantage. When you have to restart the quiz due to network errors, heavy access traffic, or other reasons, the system will still continue counting your time. The organizers and administrators will not be liable to any of these communication issues as well as failure to complete the quiz. The result of quiz and the final match may be covered on videos/pictures through news, official website, or TV programs. Please note that no compensation will be made for these usages. About participating to the final match during AnimeJapan on Sunday, March 24th. Elementary school students and under can not participate in the final. Underage participants are required to submit the written consent from parent. The organizers will not cover the transportation and accommodation expenses to the venue. While the event is carefully operated, the organizers and administrators will not be held responsible to any accidents, injuries, etc. that occurred in and out of the venue. Please note that we can not answer inquiries about the winning and failure status. On the event day, please be sure to bring your ID (driver's license, passport, or anything that verifies your name and age). Failure to confirm your identity will result in declining the participation. Although the finalists will receive the Premium Admission Tickets, we will not refund the tickets they already purchased. In the AnimeJapan 2019 venue, please follow the staff's instructions.